Despite a slight decline in the total number of United Methodist clergy in the U.S., the percentage of women is growing. 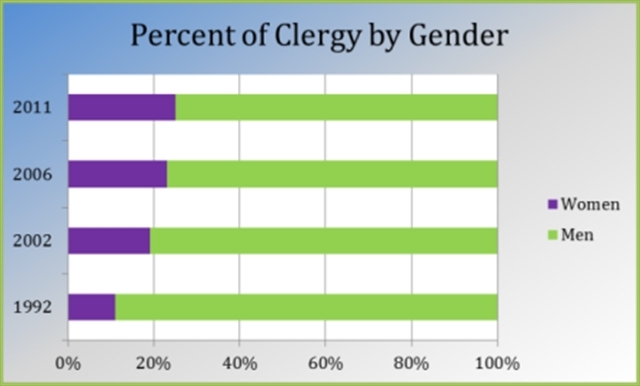 As of 2011, the most recent figures available, women were 25 percent of UMC clergy in the United States. While that 25 percent stat is an average, some of the local percentages were much higher. 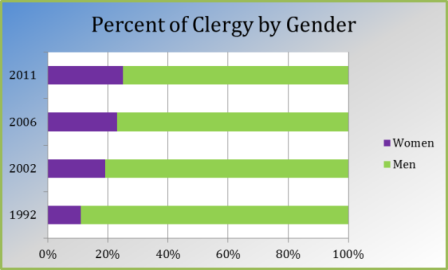 In ten of the 56 annual conferences studied, women were at least one-third of all clergy, according to an analysis by the General Commission on the Status and Role of Women (GCSRW). A complete report, including charts, graphics and a listing of each annual conference’s numbers, can be found in this month’s “Women by the Numbers” feature posted on the GCSRW website. During the latest Council of Bishops meeting, the GCSRW hosted a series of listening sessions in order to continues to assess how the church is meeting its mandate for full inclusion of women in all areas of church life. The hosts were GCSRW board President Debra Wallace-Padgett, bishop of North Alabama; Vice President Joaquina Nhanala, bishop in Mozambique; and GCSRW General Secretary Dawn Wiggins Hare. General Secretary Hare said the bishops gave good feedback on the perception of GCSRW in their conferences, the push for inclusive and expansive language and GCSRW’s monitoring of annual conference meetings and General Conference. In particular, she said bishops offered suggestions on how the monitoring reports could be improved in the future. They also raised some concerns about the “desk audit” now under way and whether they had been given enough time to thoroughly answer questions about demographics of conference employees, clergy and lay leaders. the bishops noted differences in the types of programming needed within and outside of the United States. For example, while bishops were encouraging GCSRW to continue working on inclusive and expansive English language research, one Central Conference bishop noted that God was neither masculine nor feminine in his language. General Secretary Hare said some of the bishops took printed copies of a GCSRW-produced Bible study, “Women Called to Ministry” and expressed interest in recommending it to churches or other groups wanting to study women’s roles in the UMC, including why the church ordains women. The six-session study is available in English and Spanish and can be downloaded at no charge here. To read more related to this topic, please see UMConnections article on how groups are exploring ways of supporting women in the UMC.